Four years after my original version of this post, many marketers remain confused about what buyer personas are and how to build them. This confusion can turn an important credo into a useless chore. Let’s clarify the most common mistakes that still plague those who develop buyer personas. The biggest mistake marketers make is to profile their buyers instead of their buyers’ decisions. After all, buying is the behavior marketers want to influence, so the first priority for personas is to understand the attitudes, decision criteria, and actions that cause buyers to perceive that one option is better than another. We often make the mistake of gathering buyer information that is either irrelevant or obvious. If your marketing team is debating whether your persona is a man or a woman, or if you are bogged down finding just the right stock image of your persona, then you’re focusing on the wrong things. Unless you’re a B2C marketer for products sold in retail environments, the buyer’s gender, marital status, and hobbies are rarely relevant. Imagine a biographer telling us that Amelia Earhart and Ernest Shackleton belong to an “adventurer persona.” Although that’s true, there’s nothing in this description that allows us to fully understand them, get inside the choices they make, or anticipate how they’ll respond when they face a new challenge. If your personas simply profile people, you end up with too many personas and not enough actionable information. Your content needs to influence people to change their minds, take action, and prioritize the problem you solve. To achieve this kind of influence, we need to understand what our personas think about the alternatives available to them — and what ultimately causes them to buy. Priority initiatives – What causes certain buyers to invest in solutions like yours, and what is different about buyers who are satisfied with the status quo? Success factors – What operational or personal results do your buyers expect to achieve by purchasing this solution? Perceived barriers – What concerns cause your buyers to believe that your solution or company is not their best option? Buyer’s journey – Who and what impacts your buyers as they evaluate their options and make a selection? Decision criteria – Which aspects of competing products, services, solutions, or companies do your buyers perceive as most critical, and what do your buyers expect for each? This FREE, virtual conference brings together leading keynote speakers and cutting-edge brand giants — such as Joe Pulizzi, Robert Rose, Ann Handley, Scott Brinker, Andrew Davis, Jeff Bullas, and more — to present the hottest topics in content marketing. Register Today! 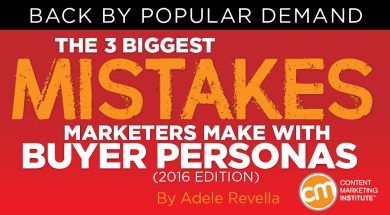 The most common mistake which I wrote about in 2012 is still the most prevalent. Marketers typically gather information about their buyers by talking to sales reps, meeting with product experts, or conducting online research. A buyer persona needs to be based on what you learn in interviews with buyers. The key point here is the need to talk to buyers. If your buyer personas are based on generic or internal ideas about your buyers, your content won’t be any better than it was before you had personas. It shouldn’t be surprising that your internal sources don’t have the information marketers need. Buyers are reluctant to reveal too much to your sales people for fear that the information will be used to manipulate them. Your product experts may interact with current customers, plus a select few of your largest prospects, but this is not representative of the larger market your content must address. What’s more, mining online data for information leads to buyer personas that are little more than job descriptions. If your goal is to produce better content than everyone else, you need insights that are not obvious to your competitors or anyone inside your company. These persona insights are so valuable that you would never post them on your website. Your buyer personas will tell you, with scary accuracy, exactly what you need to do to deliver content that persuades buyers to choose you. How to fix this: The only way to gather clear, unexpected insights about how your buyers make decisions is to have in-depth conversations with them. Spend a few hours a month interviewing recent buyers, including both those who chose you and those who did not. Ask buyers to walk you through their decision, starting with the moment they decided to solve this problem. Each conversation should take around 30 minutes. The time it will save you in planning, writing, and revising content for each buyer persona will be immeasurable. There’s some skill involved in these interviews, so do your homework first. Do you remember the nursery rhyme about the old woman who lived in a shoe? She had so many children she didn’t know what to do. Marketers often make a similar mistake when creating personas, segmenting themselves into paralysis. This happens when marketers layer buyer personas onto their existing market segments, frequently defined by demographics such as industry, geographic region, or company size. Many think they should create a new buyer persona for each of the relevant job titles in each of these segments. Not so. Doing so equates to an unmanageable number of personas. I am often asked how many buyer personas are required. This is the wrong question. Instead, you want to know how many ways you need to market your solution to persuade buyers that your approach is suited to their needs. Buyer personas must make it easy to know when a different version of your story will result in more business for the company. Will you generate more revenue if you build separate strategies? Do you have the resources to execute? When you capture the 5 Rings of Buying Insight about your buyers, you see that differences in job title, company size, and industry often have no relationship to what affects your buyers’ decisions. You need separate buyer personas only in cases where those five insights differ significantly. For example, you may find that buyers of your RFID technology in both the hospitality and consumer products industries have nearly identical priority initiatives (a mandate to be more competitive) and identical challenges (a need for incremental implementation). If you have a strong story to communicate on these two points, it makes no sense to have separate hospitality and consumer-products personas. In this case, addressing a single buyer persona may be the best way to ensure effective messaging and content marketing. To make your buyers’ needs the focus of your marketing strategies and tactics, avoid the three biggest mistakes marketers make with personas. Don’t describe the buyer; describe the buyer’s decision. Stop making stuff up about buyers; talk to them. Don’t develop too many buyer personas; look for commonalities across your market segments. Do these three things, and you will become so attuned to your buyers’ perspectives that you consistently impress them, confidently delivering content that answers their questions and persuades them to choose you. Want to learn more about buyer personas? Attend Adele Revella’s session, Developing Personas (She Had So Many Personas, She Didn’t Know What to Do), at Content Marketing World 2016. Use code BLOG100 to save $100.